The annual Wallace McCain Institute Growth Awards recognize some of the region’s most-promising business leaders for significant success in developing their companies over the past 12 months. 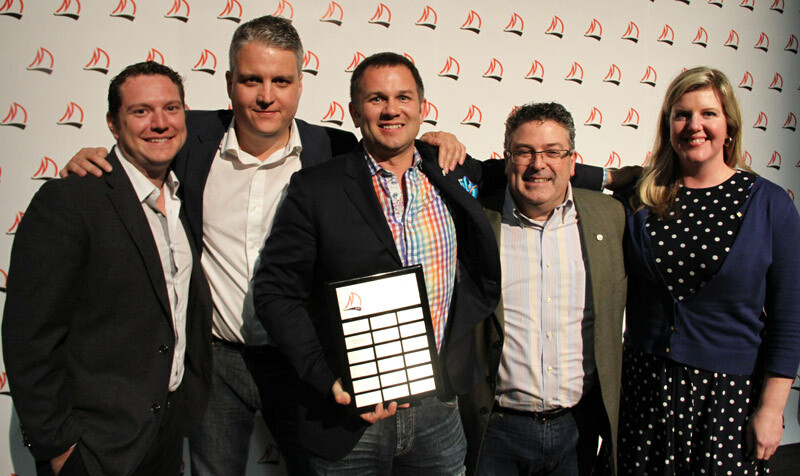 This year, the awards celebrated achievements that include: a Halifax company scaling up to take its first product to market, a Fredericton entrepreneur who tripled the size of her enterprise, a Moncton entrepreneur who has witnessed 150 per cent growth and a St. Stephen company providing home care that has grown its staff complement. “By recognizing our members who are making significant growth strides, they can celebrate together and inspire each other to push harder,” says Francis McGuire, chair of the Institute and past CEO of Major Drilling International Inc., based in Moncton. Billy English, CEO of Kindred Home Care in St. Stephen, was the winner in the category of over 100 employees. The company has grown by 60 employees over the year. Dr. Lesley Steele of Fredericton took home the prize for the 10 to 40 employees division. Dr. Steele is the CEO of Vet Alliance, a company based in Fredericton, and CBS Animal Hospital in Conception Bay South, Newfoundland. Through organic growth and strategic partnerships, her enterprises have tripled in size. Patti Ryan, president and CEO of Health QR in Halifax, won in the under 10 employees category. The firm secured a round of equity financing to allow them to hire their first employees to take its medication adherence solution to market, scaling up to eight employees from two. Karim Bhibah, president of Marathon Fluids/Bos Brothers in Moncton, won in the 41 to 99 employees category for 150 per cent growth of his ventures, including the acquisition of a third company to concentrate his holdings in value-added wood. A cash prize was awarded to the group with the combined largest growth. With two individual prizes going to Mr. English and Dr. Steele from the same group, it was no surprise when the seventh cohort of the Entrepreneurial Leaders Program (ELP7) was announced as the winner. The prize is a $5,000 grant to be used to support the cost of the speakers that the cohort involves in its quarterly retreats. The award went to Donnie Fillmore, CEO of Atlantic Pacific Transport Ltd., in Moncton. “It's always humbling to be chosen by your peers,” Mr. Fillmore says. “This is a very proud time for me.” He received his award from Nancy Mathis. executive director of the Institute. The focus of the Wallace McCain Institute at the University of New Brunswick is to support the next generation of senior business leaders in the Greater Atlantic Area to meet the complex challenges facing the area. The program is a catalyst for shifting the business culture of the province and advancing the values of entrepreneurship and innovation. The development and deepening of relationships and networks is fundamental to how the Institute delivers on its mandate. Programs range from an intensive cohort program where high-potential leaders will interact in a series of experiences, to one-off workshops and lectures on themes relevant to Greater Atlantic Area businesses. The program uses innovative pedagogy to convene people, share best practices, assist in the application of learning, and inspire change.